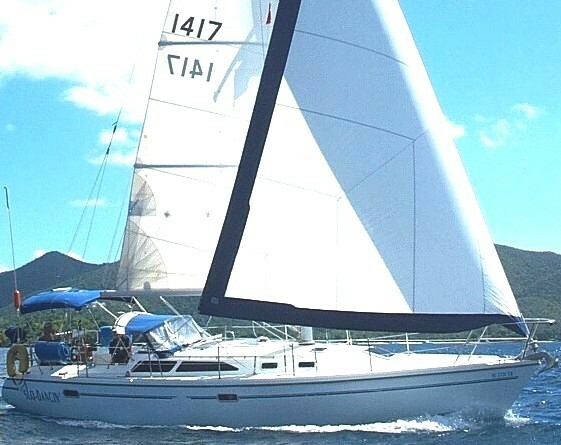 Slo Dancin, a 36 foot Catalina Mark II sailing vessel is available for Captain Only charter. This well maintained yacht is owned and operated by USCG licensed Captain Kim Caley, who will accompany you on your charter. Forever Young, a 42 foot Catalina, operated by Captain Larry Fries, is also available for Captain Only Charter. This option is for sailors with some experience and looking for more. You can do as much or as little sailing as you wish but will need to lend a hand to the captain as required. The Captain navigates the yacht but you are encouraged to get involved in the sailing. You will also need to arrange and purchase all provisions and meals including the Captain's. Assistance with provisioning is available upon request. The Captain will maintain and demonstrate all equipment throughout the cruise and will lend instruction in boat handling, anchoring, sailing and all aspects of seamanship. 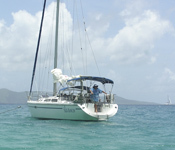 Your Captain knows the Virgin Islands sailing area very well, and also knows the best places to snorkel and swim. He can advise you on the best restaurants and fun night spots. Itinerary will be planned and agreed upon in advance but weather and wind conditions will dictate your final course. You will always be safely in harbor before nightfall each evening to avoid night navigation through treacherous reefs. Safety is a top priority, and your Captain will ensure that the vessel and all passengers remain safe. Captain only is a cost effective way to sail and an alternative to bare boating. It's also great for competent sailors who need the assistance of someone with local knowledge, or those who would like to gain additional sailing experience. Contact us at captainkim@interlinesail.com or (340) 626-8641 to discuss your options.